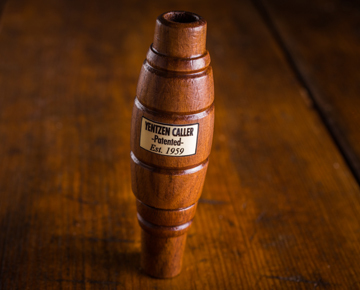 Sure-Shot Game Calls is synonymous with innovation, which began with the invention of the Double Reed Duck Call from our founders George Yentzen and World Champion and Outdoor Hall of Fame Inductee, James Cowboy Fernandez! The Classic Yentzen, Created by George Yentzen & Jim Cowboy Fernandez back in the companies inception is Back! Classics are designed to exact specs from an original Yentzen call and tuned using our proprietary methods. When you use it, you will find out for yourself, why it is still called The First and Last Call You Will Ever Use! Truly a classic. It's simple to use, and if you use it correctly you absolutely will sound like a duck and turn 'em towards your spread. It really does work well in high moisture conditions. It's the only call on my lanyard that is not a handmade custom call because it really is one of my all time favorites. Take it to the duck blind and enjoy a feet down beat down the next time you go hunting.